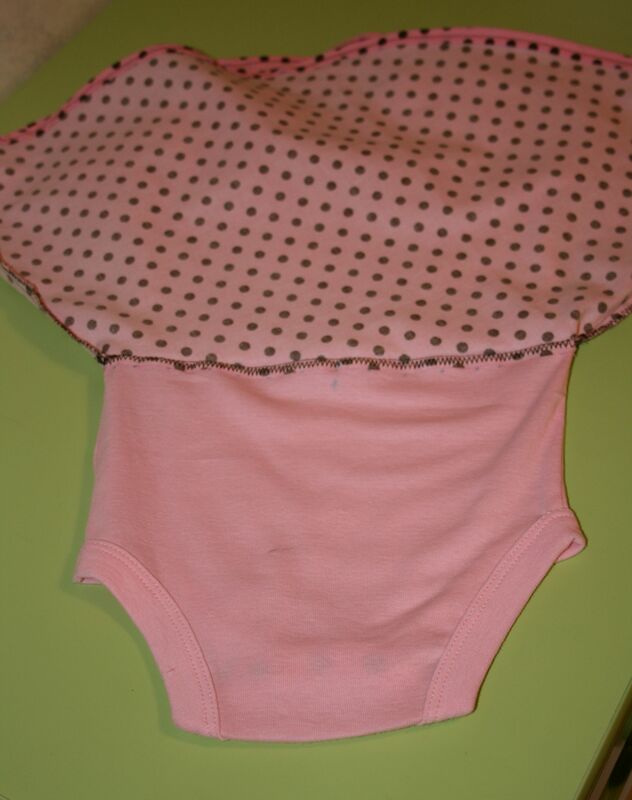 Today I refashioned a ready-to-wear onesie that I had purchased at Walmart for about $2. I used my handy dandy embroidery machine and added an applique to the front of it. I also bursted a few brain cells and created my own pattern so I could add a mock-wrap skirt to it. The picture above is the fruit of my experimentation. I’m looking forward to seeing this on my niece! 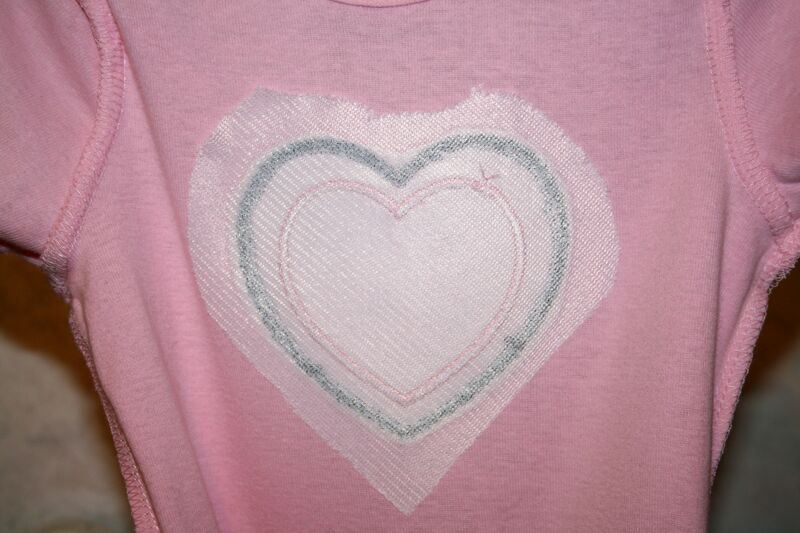 Note: To be sure you like the results, you may want to stitch out a test one on scrap fabric first. New Video Tutorial Coming Soon: My hubby filmed me going through the steps of stabilizing, hooping, and stitching out this applique on a onesie. I’ll be able to share the video as soon as he’s done editing etc. Yay! 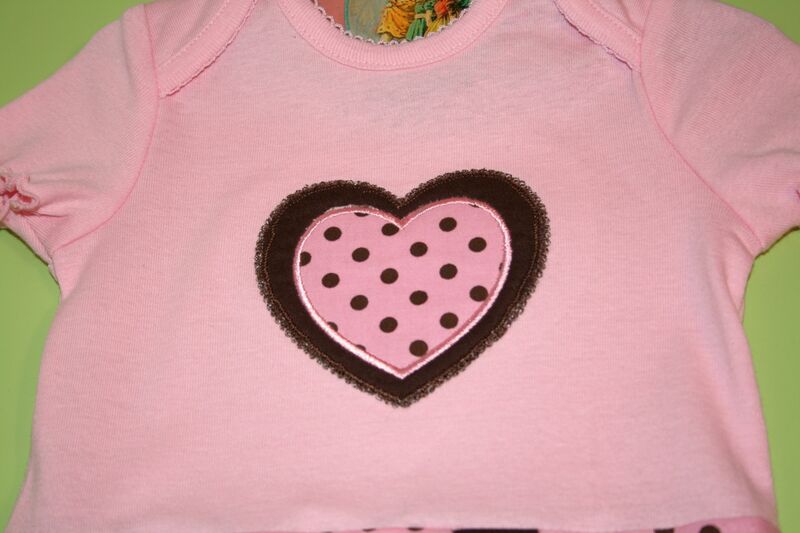 After I embroidered my onesie, I fused a stabilizer called Fuse So Soft to the back of the embroidery design. 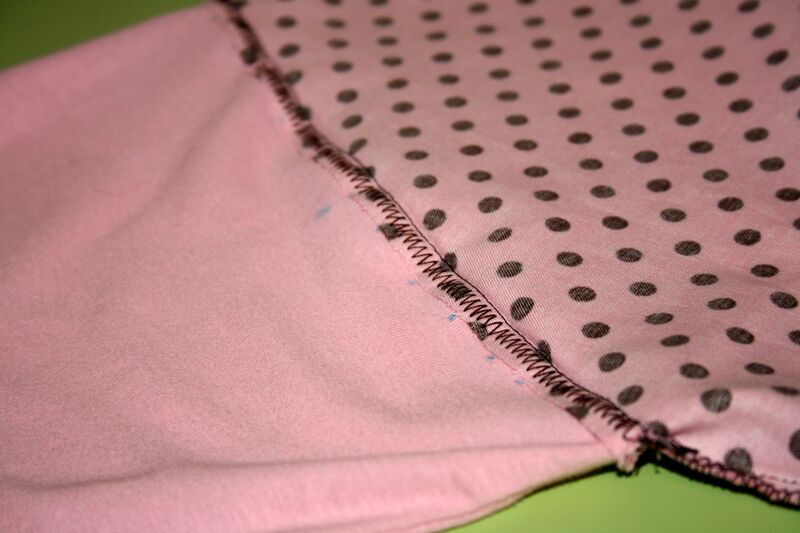 It’s like a tricot fabric, but it’s fusible and this keeps the rough threads from scratching or irritating a baby’s delicate skin. 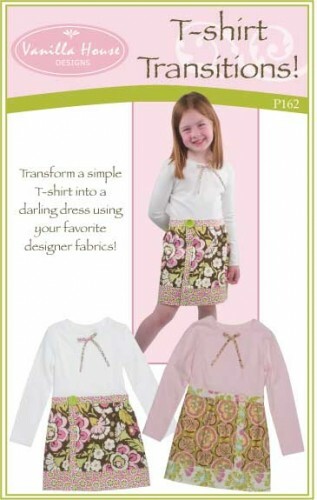 You can get it at Humble Sewing Center or order something similar online. After the embroidery was all done, I used my self-drafted miniature skirt pattern and went to town putting this cute little frock together. My skirt pattern is basically a trapezoid shape with a rounded bottom edge. See? My onesie has a mock-wrap skirt. The overlapping flap is sewn in place near my contrasting chocolate band and there are no waist ties. I assembled and hemmed the skirt before attaching it to the onesie. I marked center front and center back and placed some alignment dots across the onesie’s front and back so I’d be able to pin the skirt in place and sew without too much fuss. Can you see the placement dots? 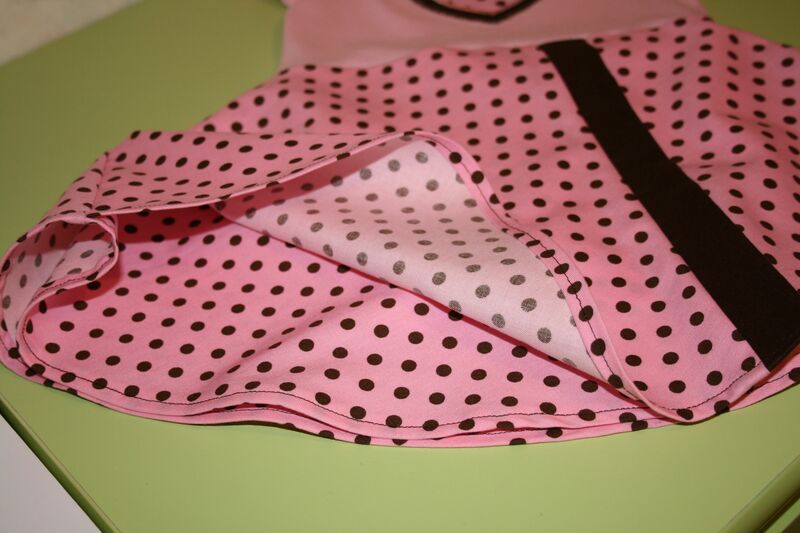 To sew the skirt to the onesie, I turned the skirt inside out and inserted the onesie into the skirt so that center fronts, center backs, and side seams were aligned and fabrics were right sides together. Then I pinned it to death and sewed all the way around. 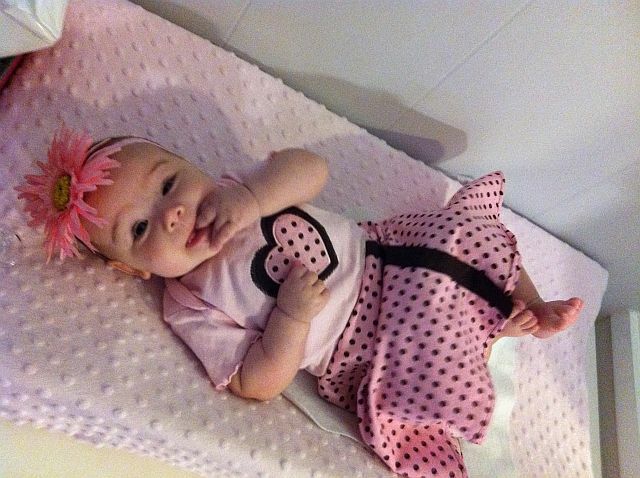 My friend’s Beautiful Daughter, Marian! I get to be Auntie Jenny! Yay!!!! I know I didn’t share a complete step by step tutorial for this project this time, but I am sharing a link to a pattern by Vanilla House that is very similar to what I have done here. See? 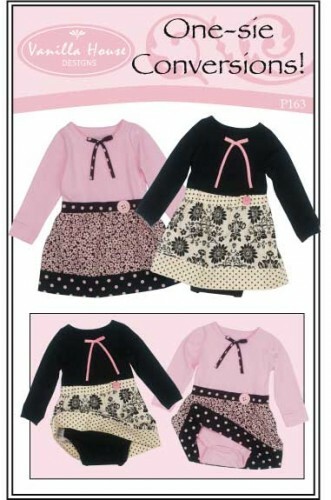 Just click the images to go to the Vanilla House website and order your pattern! 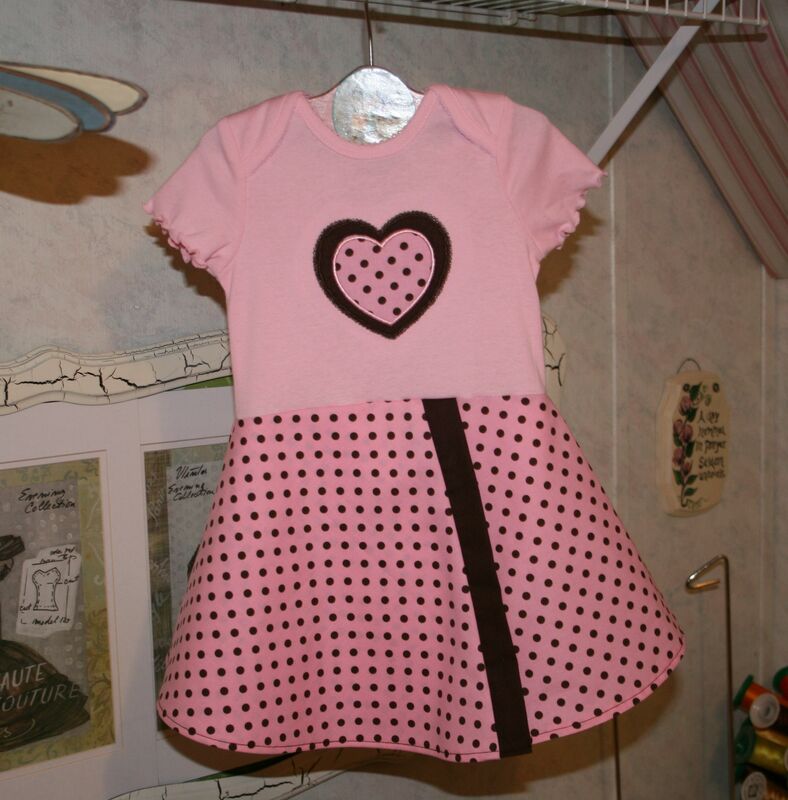 This entry was posted in Clothing, Machine Embroidery FYI, Make for Baby, Project Tutorials, Sewing FYI and tagged make for baby, mock wrap skirt, onesie refashion on February 1, 2012 by Jenny Gabriel. what width did you use for the skirt?? its adorable. 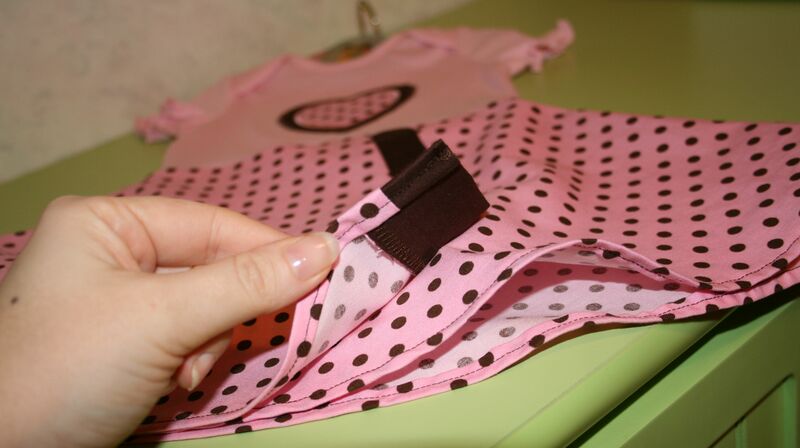 but im not sure how to measure the waist part so it stretches with the onesie. Hi! Thanks for reading the blog!